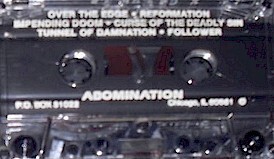 ABOMINATION is another weapon in MASTER(which released several demos with NO covers) vocalist Paul Speckmann's arsenal of Thrash and Death Metal projects. 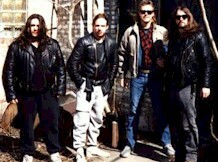 In 1987 Speckmann resolved to start afresh enlisting drummer Aaron Nickeas and erstwhile IMPULSE MANSLAUGHTER guitarist Mike Schaffer, and subsequently guitarist Dean Chioles, for the formation of ABOMINATION. A brace of demos then ensued. ABOMINATION would sign to the German Nuclear Blast concern to release the eponymous debut. Pro made Covers and pro printed cassettes. No Lyrics.